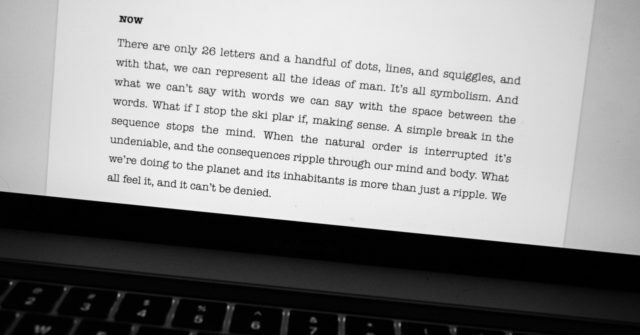 There are only 26 letters and a handful of dots, lines, and squiggles, and with that, we can represent all the ideas of man. It’s all symbolism. And what we can’t say with words we can say with the space between the words. What if I stop the ski plar if, making sense. A simple break in the sequence stops the mind. When the natural order is interrupted it’s undeniable, and the consequences ripple through our mind and body. What we’re doing to the planet and its inhabitants is more than just a ripple. We all feel it, and it can’t be denied.